This is a road-legal racer and the rollcage and rear wings are not for show. I was somewhat intimidated at the prospect of being left to my own devices with the new Porsche 911 GT3, intimidated and excited. Intimidated because the particular derivative I had was fitted with a six-speed manual gearbox rather than the more commonly chosen PDK dual clutch setup. Some might say it is a purists car, although I believe this may be something of a euphemisim for “old person” as automatic boxes just get better and better. There are fewer and fewer manual boxes around and on the increasingly rare occasions that I drive vehicles fitted with one, I regularly neglect to depress the clutch when coming to a stop until the violent shudder of a stalling engine focuses the mind. There are no such pitfalls in the GT3. Firstly you are so engaged in the drive you don’t forget stuff. Secondly the short throw lever and positive shift make you want to change gear, up or down. The four-litre, flat six, naturally aspirated engine produces 368 kW and 460 Nm of torque and although the technology in it is state of the art, this drivetrain has a sort of old-school nostalgia about it. While one tootles around town, the GT3 quitely grumbles and pings as it picks up gravel and throws it against the underbody. But as it stretches its legs this turns into a smooth roar as the car picks up speed. When the revs pass 4 000-odd there is a distinct surge as the engine comes into its own as it hauls up to about 7 000rpm, at which point it goes completely nuts. This is a road legal race car, the roll-cage and large rear wings are not for show. However it is pretty comfy at the same time and it was three and a half hours before I felt the need to stretch my legs. In the same way the engine torque makes it easy to drive the car sedately and without having to work the gearshift much. The ultra high performance tyres do work better after a bit of heat has been generated and this needs to be borne in mind. After this however the car is stuck to the road helped by the typically low centre of gravity and legendary balance built into all 911s. The GT3 sits a full 25mm lower than the Carrera S. One of the major reasons for the GT3’s superb handling is the active rear-axle steering. Depending on the speed, the rear wheels align either opposite to the front wheels or in the same direction, which improves agility and stability. 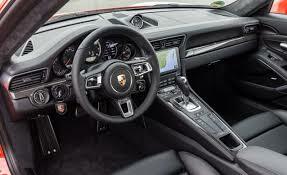 Other features that improve the car’s driving dynamics include the dynamic engine mounts and the rear differential lock (Porsche Torque Vectoring, PTV/PTV+). The 911 GT3 can accelerate from zero to 100 km/h in under 4 seconds and the manual can reach 320km/h, a touch faster than its PDK sibling which reaches 318km/h. 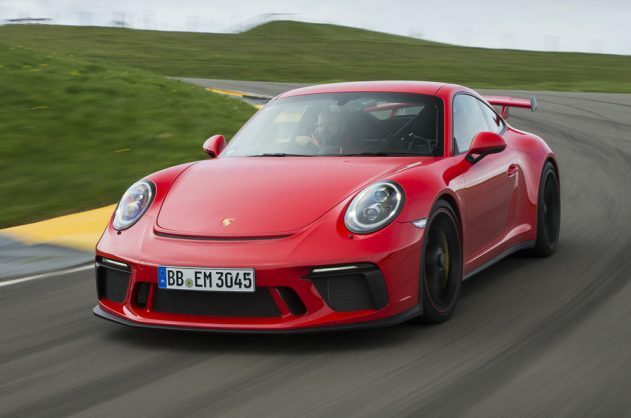 This is largely due to its engine, which is the most powerful naturally aspirated direct-injection engine and has the greatest displacement that Porsche has ever produced for a six-cylinder flat engine on the road. The power curve peaks at 8 250 rpm, while maximum torque is achieved at 6 000 rpm. The engine is characterised by its high-speed concept and high compression ratio of 13.3:1. The crankshaft spins up to 9 000 times a minute and to ensure precise gas exchange even at high speeds, Porsche developed “rigid valve control”. This means that the rocker arms are not supported on hydraulic balancing elements, but situated on axles. The correct valve clearance is set using replaceable shims in the factory, meaning no subsequent re-adjustment is required. The rigid valve drive also reduces friction losses. The variable inlet and outlet camshaft control continues to be operated by the Vario Cam system as on the previous 3,8-litre model. The electronic engine management system uses the variable valve control to regulate the valve timing depending on the engine speeds and load conditions. Unlike the PDK transmission, the manual transmission model transfers the power to a mechanically-controlled rather than electronically-controlled rear-differential lock (PTV) with locking values of 30/37 per cent (traction/ overrun). As with the predecessor model, the vehicle stability system is also tuned for sporty driving in the new GT3. The PSM can be deactivated in two stages using the ESC OFF and ESC+TC OFF functions. The Porsche Active Suspension Management (PASM) variable shock-absorber system has been specially tuned to the 911 GT3. There is a choice of two maps, Normal mode and Sport mode. The new 911 GT3 comes with Bi-Xenon headlights as standard. As with the previous model, the new 911 GT3 is also offered with an optional Clubsport package. In addition to a roll-cage with screwed attachments, the package includes preparation for a battery disconnect switch, a red sixpoint seat belt for the driver, and a fire extinguisher with mount. This vehicle will set you back a good R 2 750 000, with a 3 year/ 100 000km Drive Plan.